Panerai produced its first diving watch with a case made of bronze in 2011. 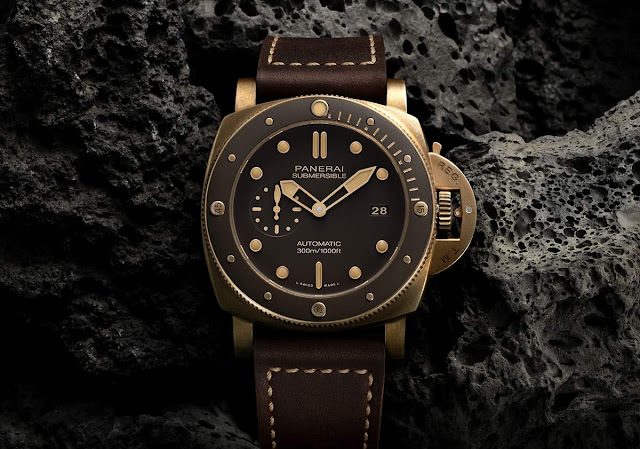 The brand has now presented its latest model crafted from solid bronze enhancing it with a ceramic bezel. 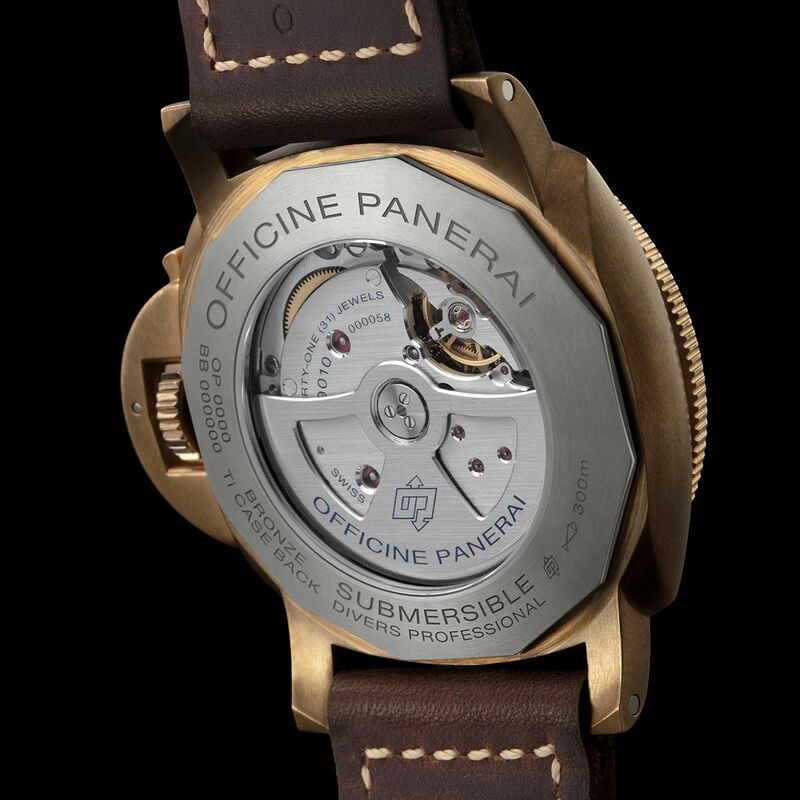 The new Submersible Bronzo PAM968 comes in an imposing 47 mm case with the iconic device for protecting the winding crown that Panerai patented in 1955. In this new version, a micro-sandblasted brown ceramic disc has been applied to the rotating bezel, which is well integrated with the brown of the dial and the strap made of natural leather. The Panerai Submersible Bronzo is water-resistant to a depth of 300 metres / 1,000 feet (30 bar) and with all the indications clearly visible even in poor light conditions. 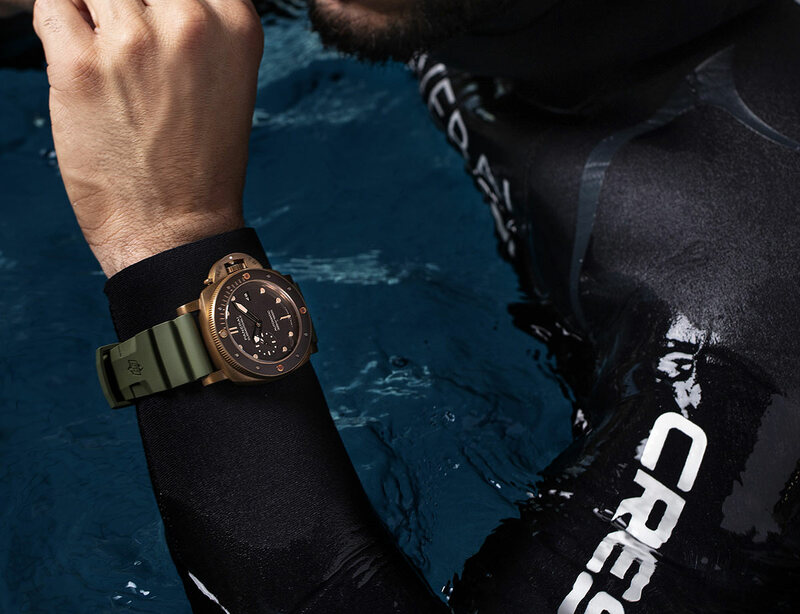 The small seconds hand at 9 o’clock is important as it indicates that the watch is running properly while the unidirectional rotating bezel enables the safe duration of each dive to be measured. Offering a power reserve of 3 days, the self-winding P.9010 manufacture calibre and its bidirectional oscillating weight can be admired through the sapphire glass porthole on the back. The movement is fitted with the device for stopping the balance wheel when synchronising the watch and the system for rapidly adjusting the hour hand, which can be moved forwards or backwards without interfering with the running of the seconds hand. The balance is fixed by a bridge with twin supports and it oscillates at a frequency of 28,800 vibrations per hour. 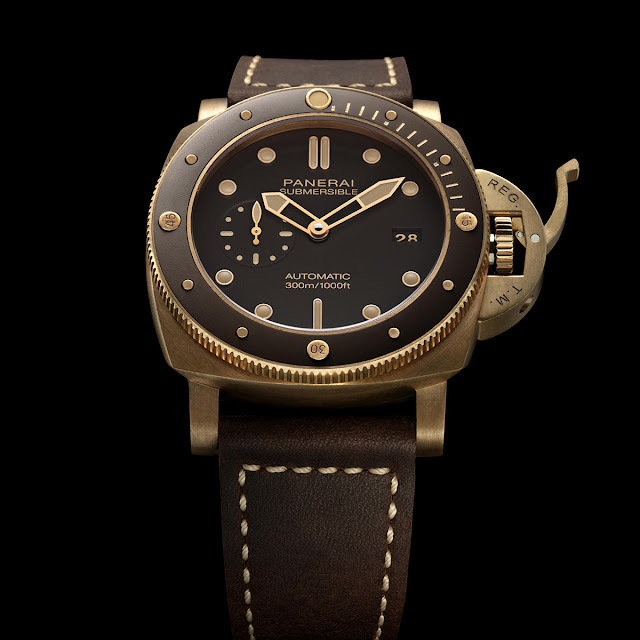 Panerai PAM968. 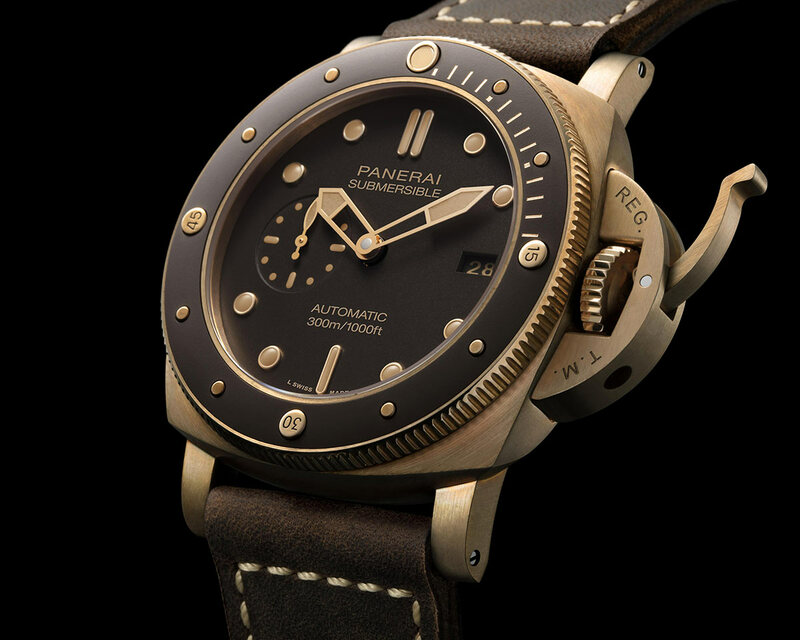 Panerai produced its first diving watch with a case made of bronze in 2011. The brand has now presented its latest model crafted from solid bronze enhancing it with a ceramic bezel. 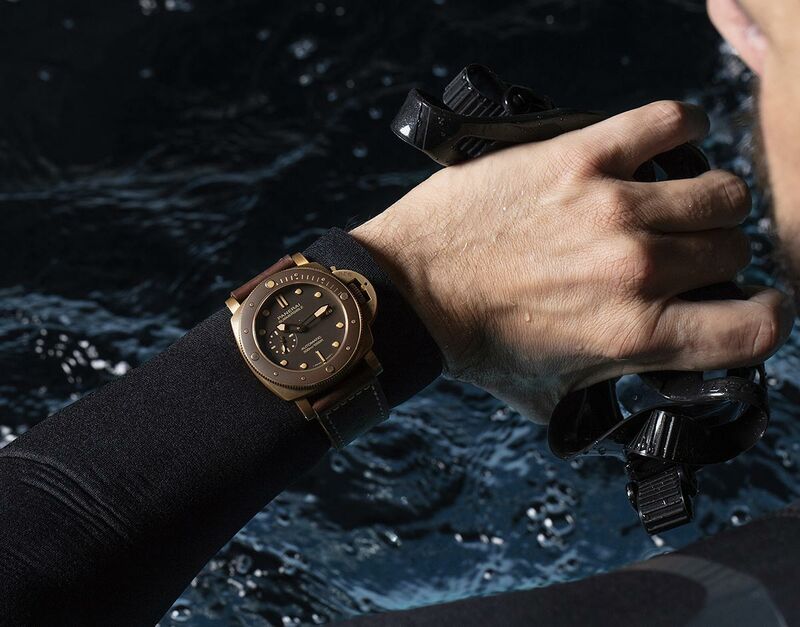 The new Submersible Bronzo PAM968 comes in an imposing 47 mm diameter with the iconic device for protecting the winding crown that Panerai patented in 1955.